It sounded like a terrible idea at the time: update Sherlock Holmes to the 21st century of texts and computer searches and blogs. To the surprise and delight of all, the first series of Sherlock, the BBC revival / revision of the classic detective developed by Steven Moffat and Mark Gatiss was intelligent, inspired, clever, compelling, and very, very entertaining. 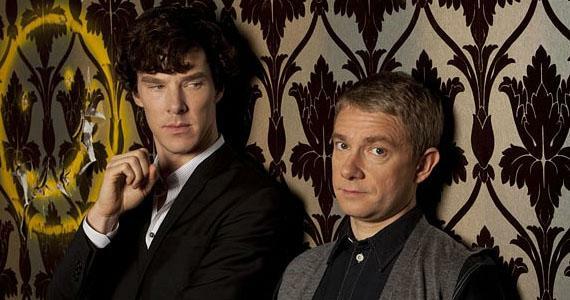 Sherlock: Season Two (BBC), which consists of three feature-length mysteries, ups the ante and the ambition. 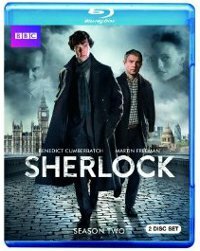 Benedict Cumberbatch’s Sherlock is still a tetchy, borderline Asperger syndrome genius more interested in a challenge than justice and Martin Freeman’s Watson holds his own as a witty, warm, loyal and often critical assistant to his eccentric roommate. But in this run the anti-social Holmes has become a media celebrity and Jim Moriarty not merely an underworld mastermind but an insane criminal who, like Holmes, just wants a challenge. The three episodes are really feature films, not just in running time but in scope and depth and complexity, and director Paul McGuigan adds a visual aesthetic to match in the first two films of the second season. We don’t simply observe the way Sherlock cases a room, we get a peek into the way he picks out details and files away observations, and an idea at the restlessness of his OCD mind. But it wouldn’t work without the characters, the fully-realized characterizations, and the chemistry. As played by Cumberbatch, Holmes is a magnificent character and this is the first incarnation to allow him to be such a thoughtless misanthrope (even while showing the cracks in his emotional armor). But let us please acknowledge that Freeman’s far less showy yet equally realized John Watson is the best screen incarnation of this character ever, an intelligent, capable military doctor with as much courage as compassion. And the makeover of Lestrade from the bumbling foil and comic relief of previous adaptations into a competent, talented police detective with both professional and personal interests in Sherlock only adds to dynamic. It’s always more interesting when Sherlock is the smartest person in a room full of smart people.